A 12-acre solar power array may soon grow in a vacant farm field in Schaghticoke, part of a spreading wave of so-called "community" solar farms proposed across the state. While there are now slightly more than a dozen such solar farms running statewide, more than 300 more are in development after receiving state approval. In Schaghticoke, developer Forefront Power wants to build a two-megawatt farm on vacant land on Verbeck Avenue, just west of Route 40, said town planner Frank Alessandrini. It would be the first such project in a predominantly rural town with a lot of farmland, although there are "fewer farmers than there used to be," he said. "It should be a good project. Doesn't make any noise, doesn't make any odors," said Alessandrini. Town planners have issued conditional approval for the work, marking the first approval under Schaghticoke's 2017 solar farm siting law, which set standards on how the farms must be built, he added. California-based Forefront Power last year pitched a two-megawatt farm in Feura Bush, Albany County, to help cover the energy needs of the Bethlehem Central School District. Unlike home-based solar systems, in which a single yard or rooftop is covered with panels, a community project is much larger and can involve thousands of panels spread across acres. Power is purchased by customers who might live far away, allowing them to avail themselves of clean energy without installing individual systems. Today, just 14 community farms are running, according to the New York State Energy Research and Development Authority. The authority is spearheading state efforts to grow renewable power as part of Gov. Andrew Cuomo's goal to dramatically cut state emissions of climate-changing greenhouse gases by 2030. Current facilities are capable of generating a combined total of less than seven megawatts, which is a small fraction of what just one traditional fossil fuel-fired power plant can generate. One such array opened last year in the Rensselaer county town of Pittstown off Route 7. There, about 1,200 panels in a five-acre field are supplying power to support the Albany City School District, with the remaining electricity earmarked for 26 homeowners or apartment dwellers throughout the Capital Region. The Schaghticoke project is just one of many more community farms that are coming. So far, the state has approved another 315 projects statewide, according to NYSERDA figures. Once built, those projects could supply a maximum of nearly 700 megawatts, which represents the equivalent of nearly three traditional power plants. Alicia Barton, NYSERDA president and CEO, said the projects will cut greenhouse gas emissions from fossil fuels and help slow man-made climate change. "Projects like these in Rensselaer County spur local investments, help create even more clean energy jobs and reduce harmful emissions while saving consumers money on electric bills," she said. 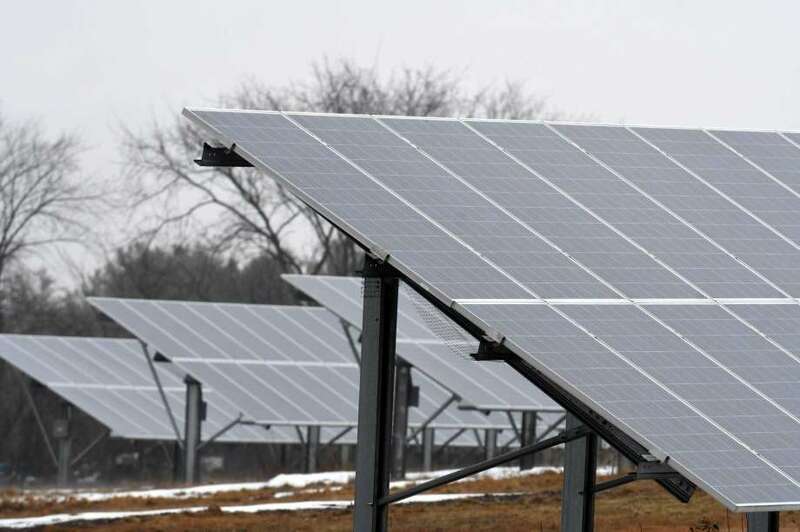 "There are some challenges to bringing on community solar, but we are committed to it," said Nate Stone, a spokesman for National Grid, the utility that covers most of the Capital Region.